Measures approximately 6” across. 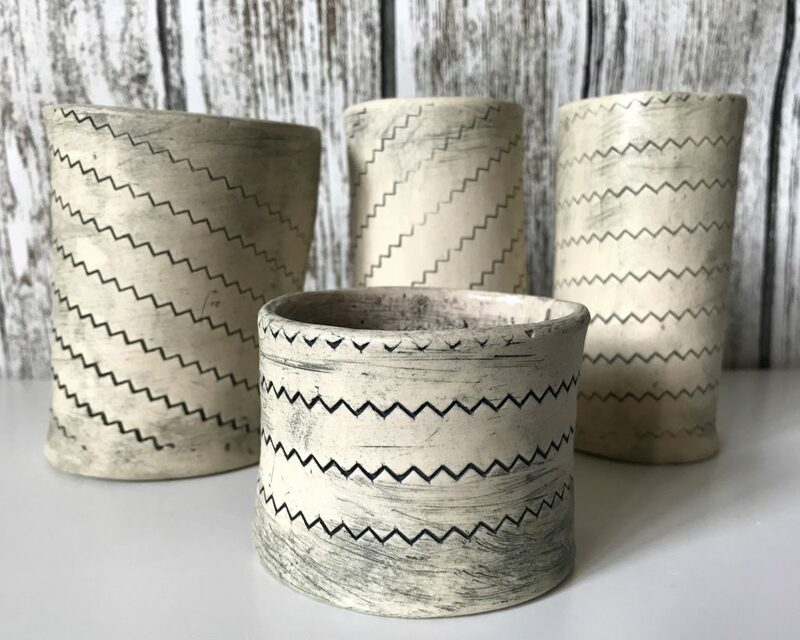 Made from white stoneware. 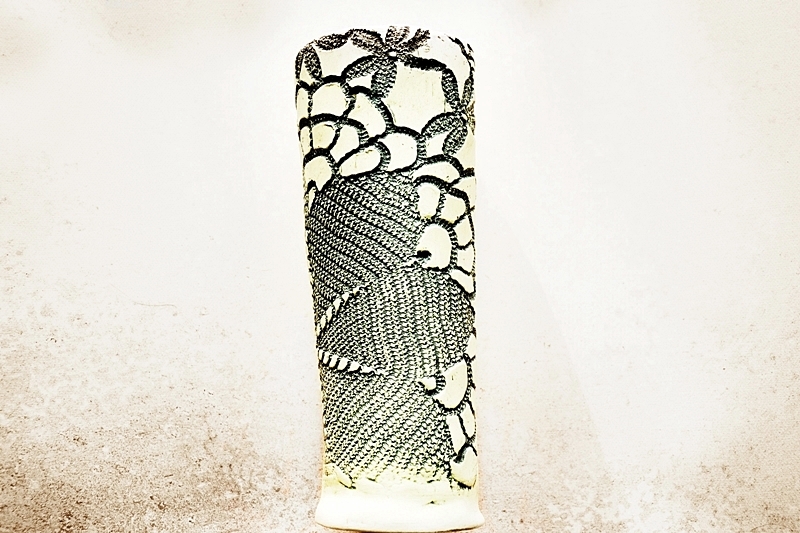 One of a kind elegant cylindrical stoneware vase, glazed inside with mate finish on outside. 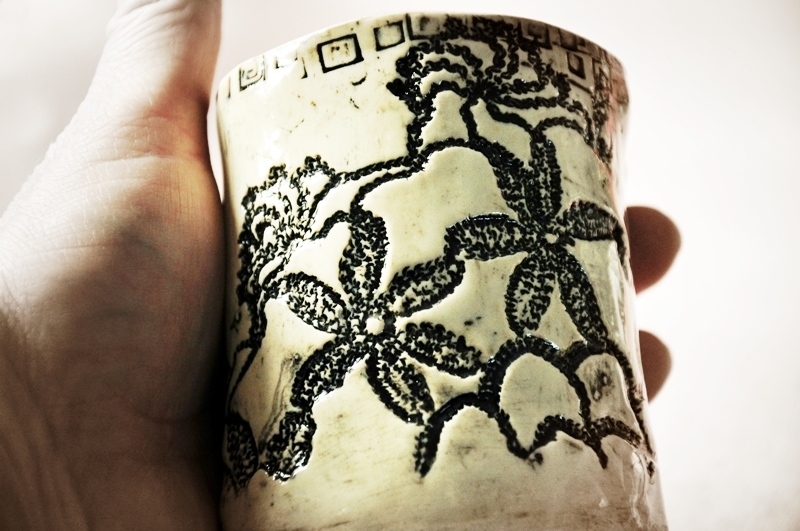 It has a lovely texture created from vintage lace impressed into the wet clay. 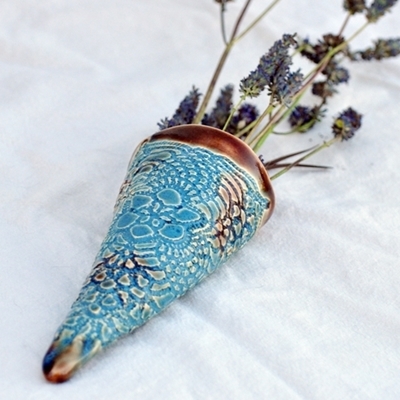 Similar vases can be special ordered in a variety of colors. Measures 5″ (12.7 cm) high. No two are exactly alike. 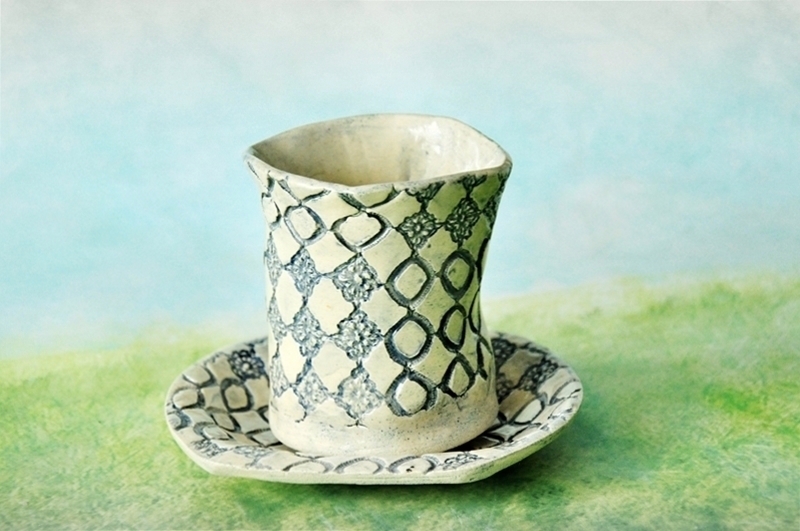 This glaze combo is one of my most popular. 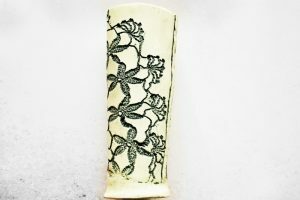 One of a kind stoneware vase or pencil holder, glazed inside with a green oxide wash on the outside. 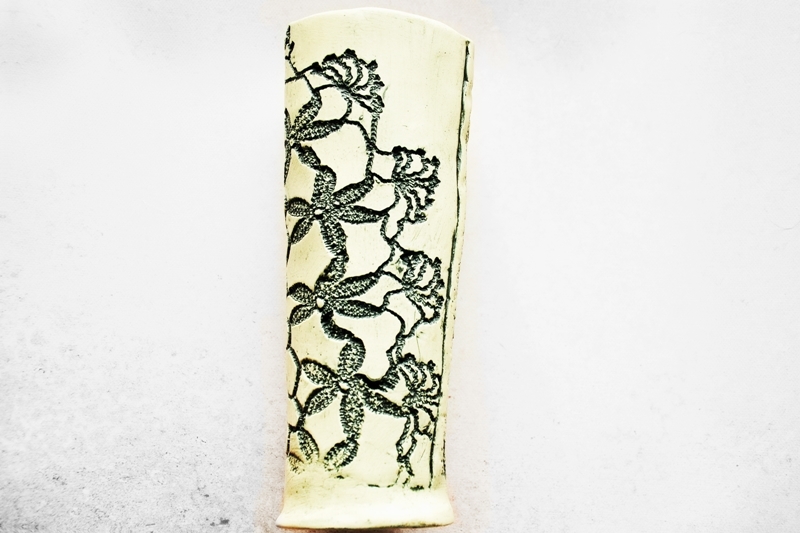 It has a lovely texture created from numerous Elm leaves impressed into the wet clay. 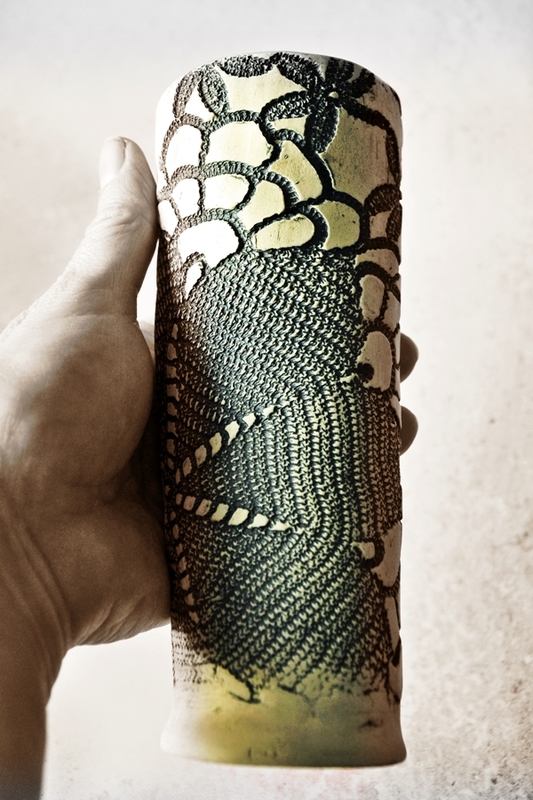 This vase was hand built from slabs of clay. Measures approximately 5.75″ (14.6 cm) high and 3″ (7.6 cm) across. 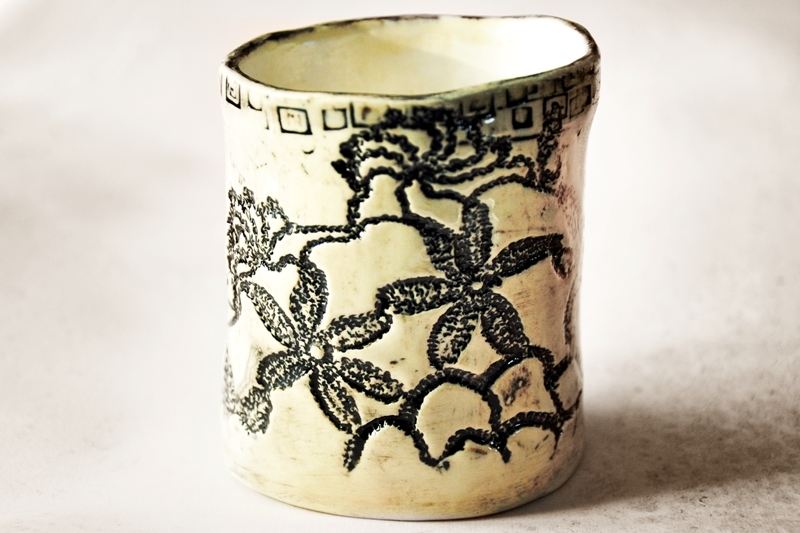 One of a kind stoneware vase or pencil holder, glazed inside with a green oxide wash on the outside. 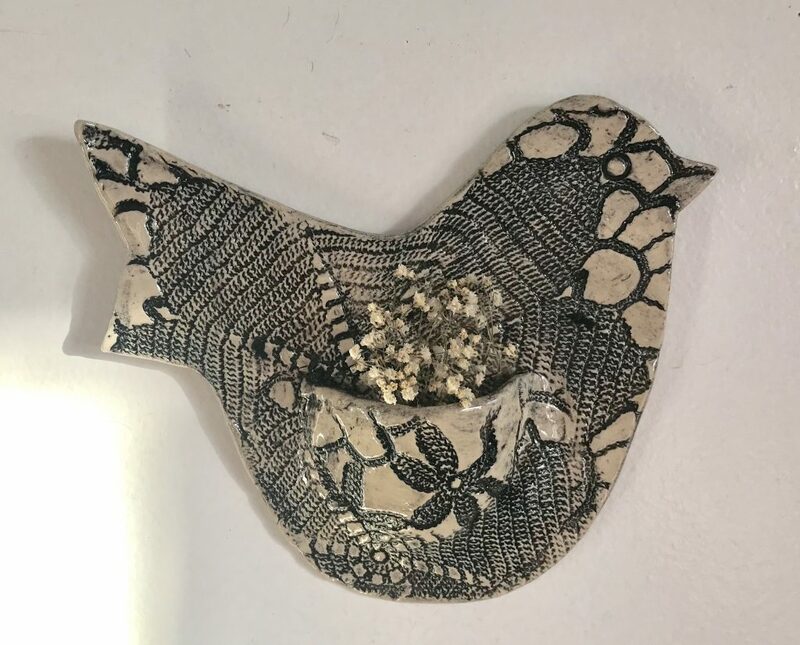 Texture was created from assorted leaves impressed into the wet clay (Manitoba Maple, Cottonwood and Siberian Elm leaves). Measures approximately 4.5″ (11.4 cm) high at its tallest point and 3.5″ (8.9 cm) across at its widest point. One of a kind stoneware vase or pencil holder, glazed inside with a green oxide wash on the outside. It has a lovely texture created from assorted leaves impressed into the wet clay (Manitoba Maple, Aspen and Siberian Elm leaves). Measures approximately 4.25″ (10.8 cm) high and 3.5″ (8.9 cm) across. 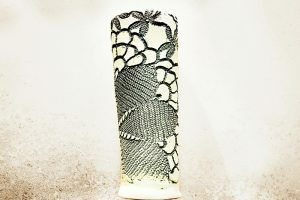 One of a kind cylindrical stoneware vase, glazed inside with a green oxide wash on the outside. It has a lovely texture created from numerous Elm leaves impressed into the wet clay. Measures approximately 5.5″ (14 cm) high and 2.75″ (7 cm) across. Dish Measures 4.5″ (11.4 cm) x 5″ (12.7 cm) x 3/4″ (1.5 cm). Holder Measures 3.25″ (8.25 cm) x 3.25″ (8.25 cm). 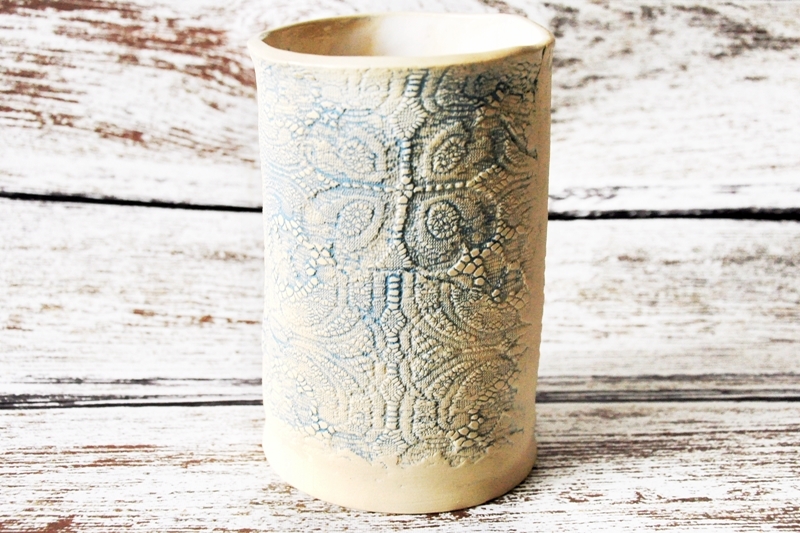 One of a kind off white/ivory stoneware slouchy vase or utensil holder, glazed inside and out with a clear glaze. Coyote shapes were impressed into the wet clay. Measures approximately 6″ (15.24 cm) high and 4.25″ (10.8 cm) across. 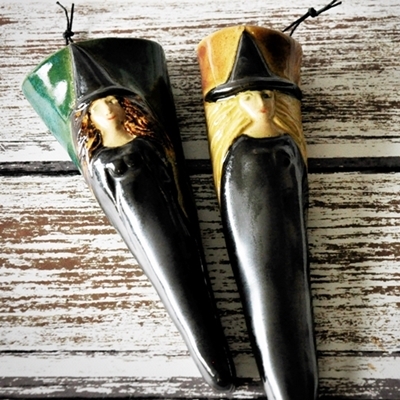 Glazed wall pocket with witch sculpture, available in numerous colors. No two are alike.